ANOTHER YEAR, ANOTHER FA Cup goal to stun a Premier League side. 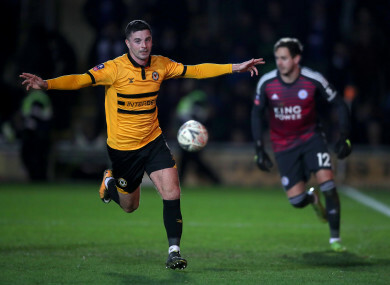 Last year, Newport County striker Padraig Amond found the back of the net in their fourth-round tie against Tottenham but Harry Kane forced a late draw and subsequent Wembley replay. And yesterday, the Carlow man did it again, this time an 85th-minute penalty to knock 2015/16 Premier League champions Leicester City out of the competition. 30-year-old Amond made no mistake from the spot and sent Rodney Parade into raptures, with unbelievable scenes on show around the League Two outfit’s home. “No one gave us a chance going into the game apart from the players in the dressing room and the staff,” Amond told Off The Ball AM this morning. “It was brilliant to be able to hold onto the victory and get the just rewards. As much as last year was brilliant with the Spurs one, the moral victory of it all — I had said before the game that this was a bigger game because they’re the Premier League champions from a few years ago. The former Shamrock Rovers and Sligo player got the better of his ex-team-mate Danny Ward between the posts, and admits that there were little to no nerves on show. “It was just a case of getting the ball and putting it down on the spot quick, don’t let anyone try get into your head. There was a couple of the Leicester players saying a few things to me to try and put me off,” he said, later revealing it was James Maddison. “I used to play with the goalkeeper as well at Morecambe. He would have faced a lot of my penalties in training, so I was hoping either he forgot what I do, or just hope he goes the wrong way. Amond laughed in the post-match conference afterwards that he’d have “quite a sore head” writing his column for this week’s Carlow Nationalist. His work had to be submitted by this morning; something he’s done once-a-week for the past few years about everything and anything in football. “I might do it on five in-a-row for Ole Gunnar Solskjaer as Man United manager,” Amond, who has scored 15 goals and produced five assists this season, joked about this week’s offering. While the Irishman was the hero, Jamille Matt powered Newport into the lead through a brilliant header with just 10 minutes on the clock. Rachi Ghezzal cancelled that out eight minutes from time and it looked as if the visitors would leave with a draw. But a huge shock ensued, as the side 74 places below the Foxes in the league standings came out on top. “It’s almost Roy of the Rovers stuff,” Newport boss Michael Flynn told BBC Sport afterwards. “I can’t believe it. It’s the first time I’ve beaten a Premier League club as a manager so it’s one I’ll never forget. “It’s huge; it’s massive for the club to be in the fourth round again and to get some much-needed finances. To see the number of supporters out there and produce that for the fans is amazing. Email “'An unbelievable moment' - Carlow striker basks in glory after knocking Leicester out”. Feedback on “'An unbelievable moment' - Carlow striker basks in glory after knocking Leicester out”.